When I mentioned that I had finished my project to make my desk "switchable" from standing height to sitting height, I got a few requests for pictures and details. My office was a mess right after finishing the work on the desk, so I had to put taking pictures off for a bit. Now that I've cleaned it, I can share what my set up looks like. 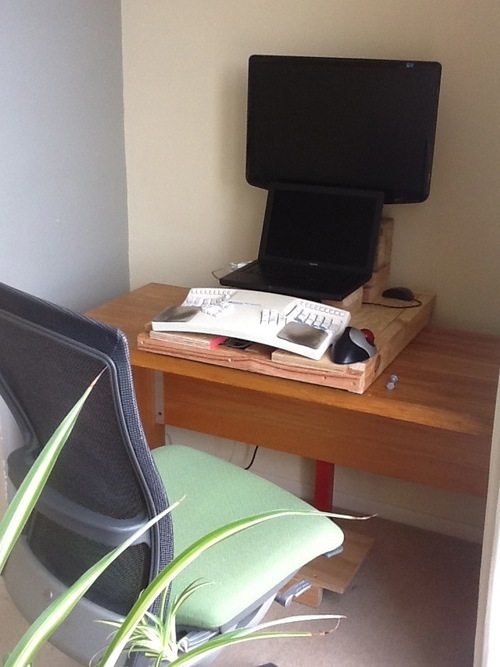 Sitting, my Life chair is at full height to accomodate the platform's additional height on top of the desk. I have to use a foot rest to get good ergonomics. Note the red vertical post peeking out from behind the desk. That is what allows the platform to be adjustable. Note the bolt on the right. 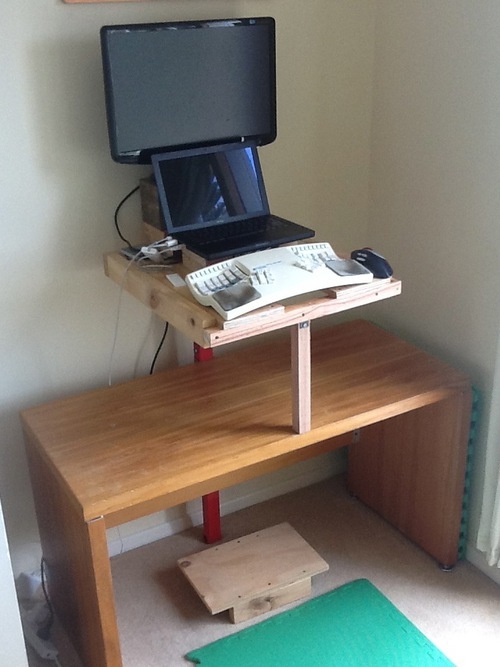 It what acts as a lock in the vertical post when the desk is in standing mode. Another view. I use a pretty crusty old rig. My Kensington trackball and programmable Kinesis keyboard are both over a decade old (the Kinesis is reprogrammed to have the thumbkeys optimized for emacs use; home -> left thumb control, page up -> right thumb control, right thumb control -> mapped to option/meta). The monitor and the Macbook are about half that. I prefer vertically arranged dual monitors, as side-by-side invariably gives me a kink in my neck. 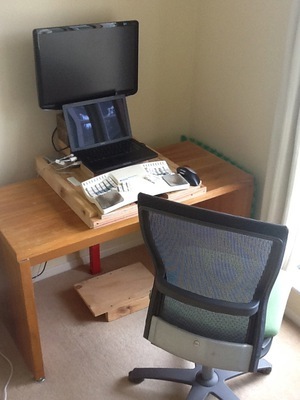 When I switch to standing, I place the monitor on the desk to make it easier to move up. You can clearly see in this picture that 1) the platform is made out of scrap wood and 2) I'm not a finish carpenter. I use a rubber mat for extra foot support. 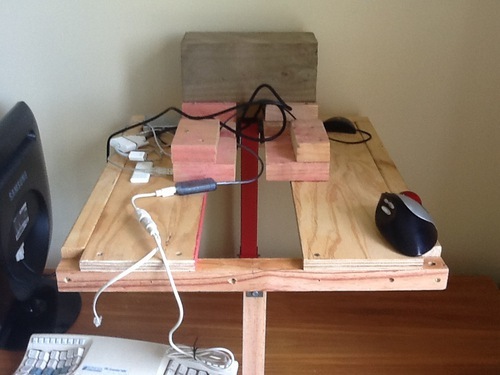 The trick is the hinged vertical support at the front of the platform. The platform sagged when I just used the single vertical post in the back. You can see the lock bolt in place just above the desktop. 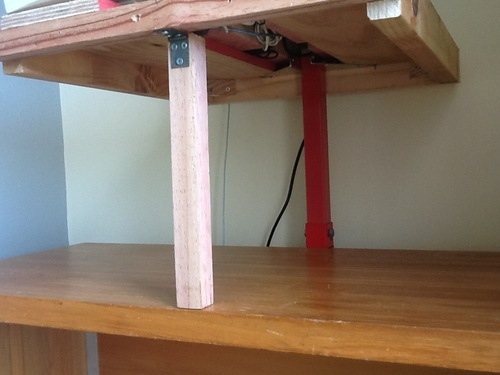 The red vertical post is a heavy duty hoist swing arm that I had laying dormant in the garage. I didn't modify it as I may want to reclaim for the hoist at some point. So I had to work with its existing bolt holes. Thankfully they are at the right heights! I attached platform to the post with some metal angle brackets (the only thing I bought new) that I ran the bolt through and then screwed to the wood platform. The middle "cutaway" in the platform is handy for cables, etc., but is really just a happy accident from being limited by what wood I had around. The desk itself I picked up from a friend that was closing down an office. Scratched up and ratty, but it has minimalist charm. 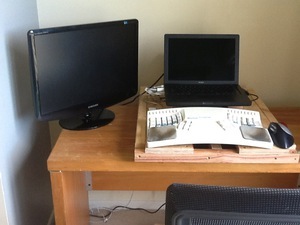 I screwed some scrap blocks of wood onto the platform to get the staggered height for the laptop and the monitor. Now I can switch between standing and sitting as I want. Very happy! This is definitely one of the more unique sit/stand setups i've seen. Very creative!